What’s the word with GERD? Wednesday, Mar. 27, 2019 | 6:30–7:30 p.m.
Heartburn affects at least 14 million Americans every day, according to estimates from the American College of Gastroenterology. 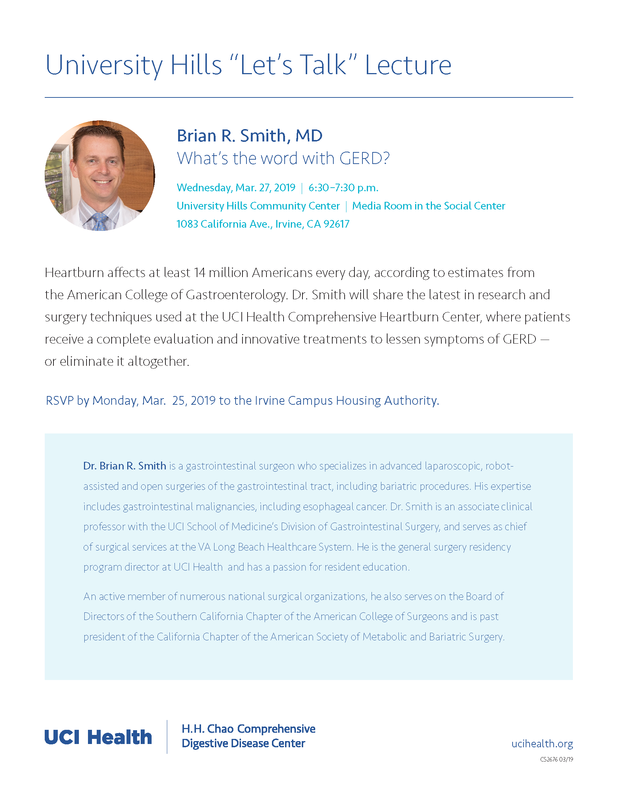 Dr. Smith will share the latest in research and surgery techniques used at the UCI Health Comprehensive Heartburn Center, where patients receive a complete evaluation and innovative treatments to lessen symptoms of GERD or eliminate it altogether. Dr. Brian R. Smith is a gastrointestinal surgeon who specializes in advanced laparoscopic, robot-assisted and open surgeries of the gastrointestinal tract, including bariatric procedures. His expertise includes gastrointestinal malignancies, including esophageal cancer. Dr. Smith is an associate clinical professor with the UCI School of Medicine’s Division of Gastrointestinal Surgery, and serves as chief of surgical services at the VA Long Beach Healthcare System. He is the general surgery residency program director at UCI Health and has a passion for resident education. An active member of numerous national surgical organizations, he also serves on the Board of Directors of the Southern California Chapter of the American College of Surgeons and is past president of the California Chapter of the American Society of Metabolic and Bariatric Surgery.